The City of Cleveland in partnership with Mainstreet Cleveland has created an interactive web map for this year’s 30th Halloween Block Party in downtown Cleveland. The interactive map utilizes geographic information system (GIS) technology. The goal of this project is to better help Block Party guests more easily locate the event’s different activities. The 2017 Block Party map includes: road barricades; fire; police; medical staff stations; concert stage locations; Treat Street; restroom locations; bounce houses and the lost child station. The interactive map is also mobile responsive to allow residents and visitors to access this information during the event. The City appreciates the time and effort the Information Technology Department contributed on this project. 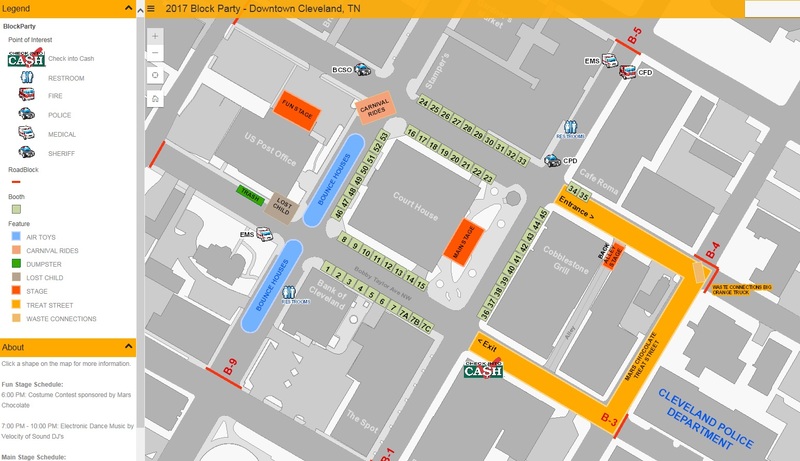 The interactive web map can be accessed by going to: https://gis.clevelandtn.gov/BlockParty.